Hey there, welcome to another Good Morning Mondays. Another week, another lot of activities has passed and we have a new week and new beginnings happening. I enjoy the beginning of the new week almost as much as I look forward to the weekend. I look forward to planning what I am going to achieve and the school I am going to get done. Sometimes I don’t achieve anything I want to, but that’s okay, life isn’t about things but about people. This past week we had our Revelation Bible Study on Tuesday night. This was a good night and we enjoy getting into God’s word and studying and discussing scriptures. I bottled some apple juice this week and this was the first time I have done this. We wanted to see what it was like and we were really pleased with the results. We had it with our Mothers Day lunch mixed with lemonade and it was delicious. I also managed to can some ground meat which will be great for the colder months. We had a sewing afternoon this week and because my husband was already there doing some work we went to our friends house for lunch and enjoyed a lovely meal together before getting into sewing. The girls’ quilts are coming along nicely and we might even finish sewing them next time. Then we have to snip them and put them in the dryer to fluff them up. Here are the girls at their sewing machines, they get on so well and it is a pleasure to see them have such a lovely relationship. Saturday morning the children had their music lessons and my husband had to work, so I took them in, did some shopping and came home. 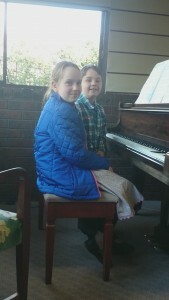 Here they are sitting at their teachers piano. They had just finished playing their duet and as soon as they finished they both turned to her to see what she thought. Their playing is coming along really well. I hope you all had a lovely Mothers Day yesterday. 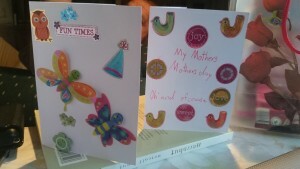 Here are the cards our youngest two made me, they were so lovely and the stickers were just so cute. The inside of the cards were filled with words of love. I am definitely going to keep these in a special place. The weather has been quite cold and damp this past week and here is our front yard below. I really enjoy this season and I just love the way the grass greens up and everything looks fresh and damp. 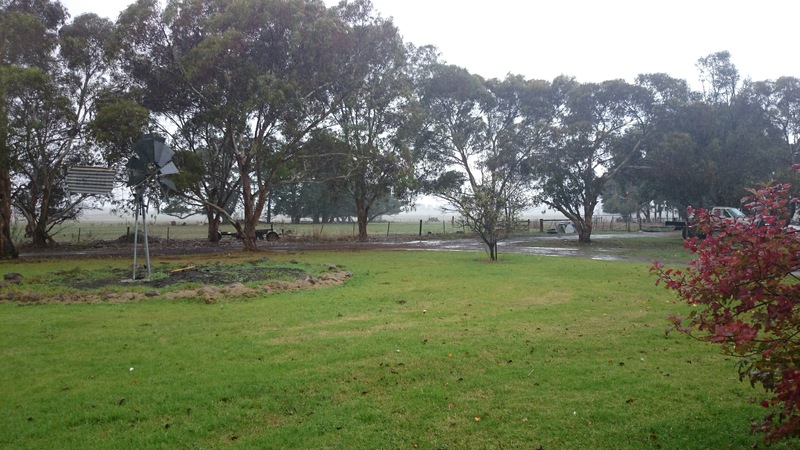 It isn’t easy for my husband though when he has to work out in the cold so I make sure that the wood stove is going all the time to keep the house warm and inviting when he comes home. Once again I am sorry, but I didn’t get all the posts read this week. I want to thank you all for linking up and for those of you who comment. I am blessed by the friendships that we are developing and I am always interested in what you are doing and how you live. If you haven’t gotten to read these posts, pop over if you get the time and you will surely be blessed. I’ve got a quieter week this week and I am looking forward to being home. Tuesday night we are selling some sheep so I will probably go with my husband to deliver them to the sale yards. Then we might go and visit our friends Mr and Mrs H. Mr H had an unfavourable report this past week and again I ask for your prayers for him and his family. He has more cancer spots on his liver and his lymph nodes. He has an amazing attitude and we are so blessed to be able to share this journey with him and his family. I hope you all have a great week and you are enjoying each moment with your family. Previous PostA SOFT ANSWERNext PostWHY DO I DO IT? Thanks so much for hosting and sharing your link up! It sounds like you had a lovely week, dear friend. I am so thankful for your wonderful blog, our sweet friendship, and the fellowship we share across the many miles. May God bless you richly this coming week. I loved seeing the picture of the two little girls sewing…it just warms my heart to see children being raised in the ways of God and to be good homemakers. You are doing a wonderful job! Ok, – So you alternated drinking your apple juice with the lemonaid? Or you literally mixed them together? If so, what was the ratio? 2- When I pray for godly friends for my children, I imagine pictures just like the one you posted. Thank you for sharing those updates and pictures so often. It is such an encouragement. 3- Saw the news from Melbourne (sp?) last night. Praying for you all. 4- More prayers from across the pond for Mr. H.
Okay, our lemonade (I think) is different to yours. Ours is like a fizzy soft drink which is a great base for making different flavours, I think yours is actually squeezed lemons and sugar without the fizz (am I right???). Graeme mixed the two together and it was like 1/2 apple, 1/2 lemonade, he just kept adding more until it tasted right, it was delicious. So now I am going to juice the bags of apples I have and bottle it for the coming months, it was just like a sparkling apple cider without the alcohol. 2. It is wonderful to see the way these girls get on. My daughter has a few homeschooling girl friends and they all have great relationships, it is so different to the relationships she has with a few schooled children. These girls are not as consistently nice and the relationships come with baggage, even at this young age. 3. I had to look the news up, this having no television just doesn’t keep me updated, I am glad we live out bush (so to speak) when it comes to these issues. Thanks for your prayers. 4. Also thanks for praying for Mr H, he really is amazing and our relationship with him and his wife is only getting better, we so want to help them, but sometimes prayer is the only thing we can do – that and make really chocolatey biscuits. Thanks for featuring my post! Looks like the sewing went well – glad it all came together. I do love the colder weather as I have been hand quilting at night again. Happy Mother’s Day for yesterday. 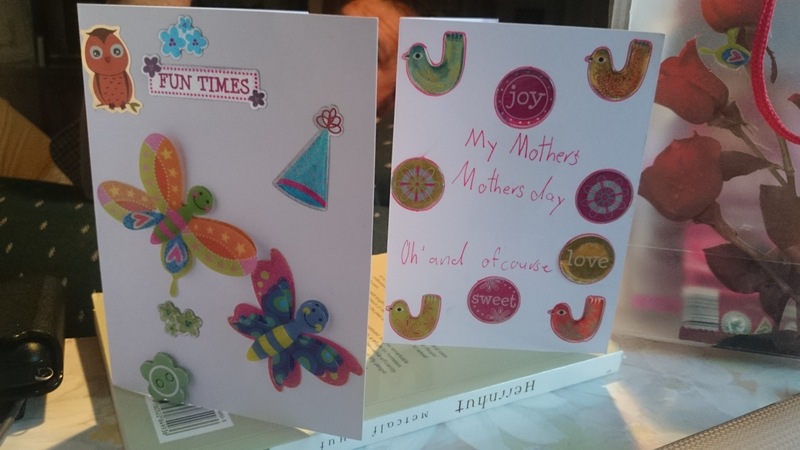 I just love receiving homemade cards – they are just so sweet. Thanks for featuring my post this week! You’ve had quite the productive week. I don’t have as much driving to do this week, so I hope to do better at home. Blessings from the middle of the USA. Thanks Laura for faithfully linking up each week, I appreciate it and am glad that I could feature you. I hope you can be home heaps this week and get everything done on your list of things to do. Have a good one. Blessings. Thank you so much for featuring my post Terri 🙂 and what a lovely picture of the girls and their sewing machines. Blessings. Sounds as if you had a very productive week! I love the picture of the girls sewing together! 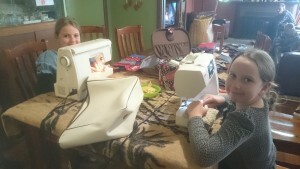 My daughters love sewing as well. I love seeing them express their creativity. Thank you for the link-up! Have a wonderful week. Thanks so much for being such a welcoming hostess each week! Terri, thanks for another great linkup and for linking at Mondays @ Soul Survival. Donna. It is always a pleasure to catch up with you – I love the things you share! Such a wonder, isn’t it, how God weaves our lives with so many precious moments?! Thanks for hosting this link-up. It’s always my joy to join the community! Thank you for doing the link up! I enjoy going through the various blogs posts and reading. I don’t get to put new ones in of my own much here lately for lack of writing but am enjoying reading the new ones out there! It sounds like you have had a great week! That is great that the kids are sewing–that is a skill that is pretty handy all through life, and sure helps a budget when it comes to fabric based things! Thanks so much for your comment and I must admit I have missed your posts but I totally understand. I am glad that you enjoy reading some of them though. Have a great week and blessings to you all.